Grillo is working on the development of a new, direct and sustainable process to produce methanesulfonic acid (MSA, CH3SO3H) on an industrial scale. Scientifically speaking, this process may be considered no less than a breakthrough in the field of methane functionalization (CH4). VCI NRW and its associated chemical companies support the UN Sustainable Development Goals (SDGs). The association has planned several activities in connection with sustainability for spring 2019, e. g., an exhibition in the parliament building and a networking evening; Grillo is represented with two highly-innovative projects. Scientific article on Grillo methane sulfonation with details on the cationic chain mechanism initiated by a low concentration of added sulfonyl peroxide and propagated by CH3+ under superacidic conditions. Furthermore, the broader perspective (“Making more from methane”) by Fredi Schüth from the Max-Planck-Institut für Kohlenforschung, Mühlheim. Various news outlets reported about the paper published in the Science Magazine. Professor Seeger and his team at the University of Zurich (Switzerland) have done a comparative life cycle assessment (LCA) of the conventional process for the industrial production of MSA with the new and direct process developed by Grillo. High-pressure metering pumps produced by the Berlin-based manufacturer of laboratory measuring instruments Knauer Wissenschaftliche Geräte GmbH have played an important role in the development of the groundbreaking new manufacturing process allowing the production of methanesulfonic acid (MSA) directly from methane and sulfur trioxide. The International Symposium on Homogeneous Catalysis (ISHC) takes place every two years and is one of the most important scientific conferences on homogeneous catalysis. At first glance, world-class research and a medium-sized basic chemicals company do not seem to go together. 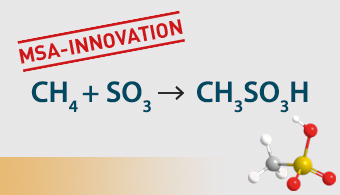 In a presentation we had the opportunity to explain the reasons why it was no coincidence that a team from Grillo has been able to produce methanesulfonic acid from methane (CH4) and sulfur trioxide (SO3). The European Biogas Conference is the annual gathering of the members of the European Biogas Association (EBA). Over two days the participants have the opportunity to discuss current sector-related topics in lectures and workshops. In 2018, the focus also laid on the industrial use of biogas. For the first time, methane was converted into a liquid resource by using a simple process suitable for industrial use. Chemists had long been looking for this key to many new applications. The functionalization of methane to a high-value chemical has been achieved by Germany’s chemical company Grillo after years of intensive research. The new process leads to high-purity methanesulfonic acid (MSA) by the direct sulfonation of methane with sulfur trioxide. Start of large-scale production is planned for 2019.